If you care about your cat and if you care about the environment, there is no other way but to choose a cat litter that respects both! Our little animals produce an awful lot of waste every year. Some studies even compared their carbon footprint to that of a compact car! Cat litter plays an important role in this situation and it is our duty to try as much as we can to reduce our impact on the environment while providing our cats a safe and natural litter free of harmful chemicals. Also available in clumping version (clumps more but has a tendency to track more). Why choose a biodegradable cat litter? Though regular cat litters are efficient, most of the time they pose a real danger for the environment. With almost 100 million cats owned in the US alone, you can easily imagine the amount of waste cat litter is creating. Why is regular cat litter so bad? For your cat: Depending on the composition of the litter, it could affect your cat’s health. Some litters are made of harsh chemicals and it’s easy to understand why you do not want that on your feline’s paws (which after self-bathing get’s ingested). For you: The production and handling of litter creates dangerous airborne particles that are harmful for the environment and human health (PM10 – particles that aggravate the lungs). For the environment: Clay (one of the main components of most classic litters) is a non renewable resource extracted from earth in exponential quantities. Let’s not forget the main problem concerning cat litter: how do you dispose of the dirty litter? Whether you throw your cat litter in the trash or flush it in the toilet, this might not be the best way to protect the environment. Cat litter is a real threat to landfills, septic tanks, and ecosystems. If you find a litter that matches all those criteria: bingo! You’ve found the hidden gem and you should definitely go for it. This is what we have been looking for and the closest product we’ve found was the Feline Pine Original Cat Litter. 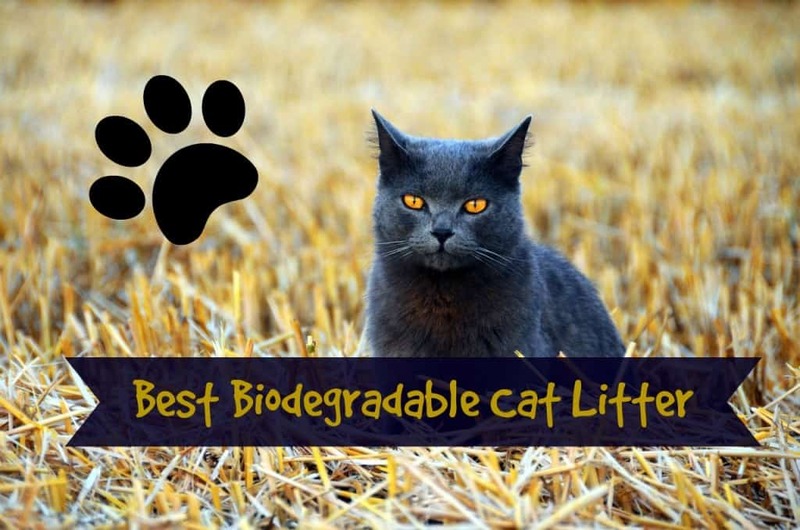 Why do we think this litter is the best biodegradable cat litter out there? From the manufacturing to its disposal, this litter is the one that respects the environment, your cat and yourself the most. Choosing Feline Pine is the guarantee of production methods respectful of the environment. 100% Biodegradable: instead of ending up in a landfill, you can simply put it in your compost pile, or in the corner of your garden. 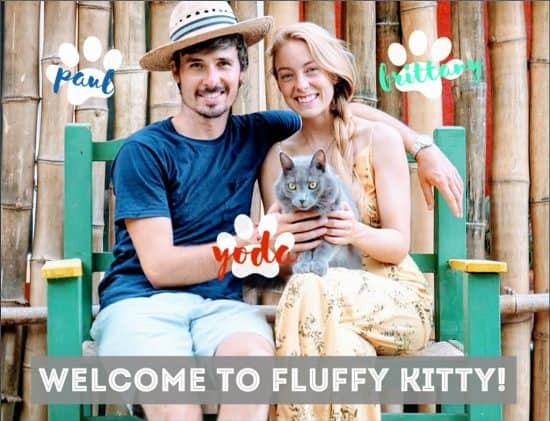 *Fluffy Kitty is not being paid to display this ad, we simply approve of the explanation they provide and would like to share it with our followers. It is possible to take a completely different turn. One that will be more more challenging but potentially more rewarding if you do it right. I’m talking about potty training your cat. It is possible and systems are here to help you to train your cat step by step until he finally gets it. By doing so you eliminate the need for litter! Pretty cool right? It does come with its own drawbacks though, just be careful and know what you get into. >>>See our full article on how to train your cat to use the toilet. One very important thing to keep in mind: cats are creatures of habits, which means that it might be difficult for them to transition to one type of litter to another one. After all, your cat will be the one who decides whether or not they’re going to use the new litter. Our advice is to take it step by step, same as if you were changing his food: slowly replace the new litter with the old one by incorporating every day a higher percentage of the new litter. As I like to say (French expression): little by little the bird makes his nest (petit à petit l’oiseau fait son nid) which means that patience is always key with our beasts. The “one step at a time” rule is very true with them as they do not like too much change happening at once. We do believe transitioning to a more sustainable way of living is a great way to contribute to preserving our planet, that’s why we highly recommend using a biodegradable kitty litter. Thanks for following FK! Drop us a little thought below or send us your questions!